The concept is the basis of indifference curve and the modern theory of consumer demand. If the consumer exchanges additional unit of one commodity for another commodity it called marginal rate of substation (MRS). In this MRS the consumer reduces the consumption of one commodity and increase the consumption of another commodity if he wants to get same amount of satisfaction. To explain this concept we can consider earlier examples. This table shows the five different combinations of apples and oranges which derive the same amount of satisfaction to the consumer because all the five combinations represented by the same indifference curve. Here the consumer increases the purchase of apples and reduces the purchase of purchase of oranges. It means he is substituting apples for oranges. The rate of substitution between apples and oranges goes on diminishing, in the 1st combination 20 oranges and one apple is the 1st stage of satisfaction. In the 2nd stage 15 oranges and 2 apples to get one apples extra the consumer has to forgo 5 oranges. It means 5 oranges were substituted for one apple. The ratio of apples and oranges is 5:1. In the third combination the ratio is 4:1. In the 5th combination the rate of substitution the ratio of substitution will be 2:1. Thus the rate of substitution goes on diminishing. It means if the consumer increase the purchase of apples the stock of oranges on the other hand decreases and the satisfaction of additional unit of orange increases. That’s why the consumer substitutes only 5 oranges for one apple. The rate at which the consumer purchases one commodity by forgoing the other commodity is called marginal rate of substitution. In this diagram we have drawn a stair case which descends to the right. The steps of this staircase are equal width but the height of the staircase diminishes from top to bottom. 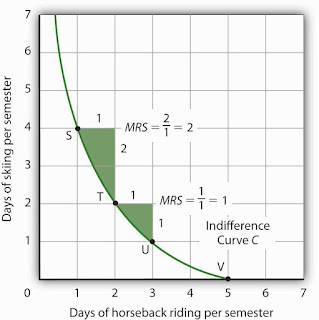 This is due to the fact that the number of apples continues to increase and the number of oranges continues to decrease at a progressively diminishing rate, because of this reason the IC curve is convex to the origin.